Use Fibonaccis for peace of mind. Here’s a recent example of of how I use technical analysis to make a quick assessment of an investments chart. An online friend of mine that works for a large investment bank asked me on June 20th, 2013 what direction I thought the market was going to take, since the markets, in general, had been retreating over the previous several days. Not wanting to do a whole lot of fundamental research on the matter, I quickly pulled up the one year chart of the QQQ Powershares Trust, which pretty much mimics the Nasdaq. Most charts won’t initially look like this, because they don’t usually show the trading channel, which I drew with the two parralel yellow lines, or the squiggley looking curving envelope that the surrounds the share prices pattern, called Bollinger Bands, or the horizontal Fibonaccis, starting at the low of a charts’ price range, and going to it’s high point, indicating various levels of support and resistance in a stock chart. What I saw was this. He had asked me on June 20th, 2013, after the market pulled back on pretty decent volume. I pulled up the chart and saw that the share price was close to a Fibonacci support level at around $69.40. But wasn’t there yet. I told him that if volume on the 21st, which was a Friday, matched the volume of the 20th, on a further retracement, then he might look for $69.40 to be tested on the following Monday. The following Monday $69.40 was retested, on larger volume, and pierced, with the share price falling below that support level, but by the end of the day, closed above that support level. Basically, by understanding how to use a tool like a Fibonaccis , I could know where the equities share price was, in relationship to it’s support and resistance levels, and assess by the volume of shares traded, the likelihood of a following share price event. On another level, knowing the Fibonaccis level of support, and how levels of support and resistance get tested, I wasn’t too overly concerned about a more drastic pullback. 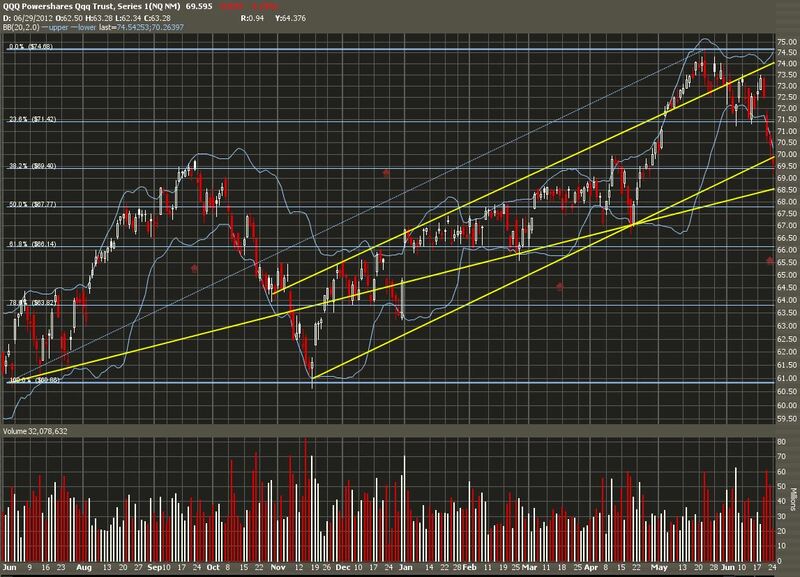 I knew the share price had to first test the support level at $69.40 before I needed to focus on a lower support level. So, understanding how to use Fibonaccis, and volume indicators, gave me a level head and peace of mind when assessing the QQQ Powershares chart. I have no position in the QQQ Powershares Trust.